The border art supplied with Word 2013 includes a variety of small graphics that look good when repeated around the edges of the page. One nice thing about using these, as opposed to manually placing images around the border, is that you can resize the entire border at once by changing the value in the Width box. A page border is a border that appears outside the margins on each page. Border art is a repeated small image that forms a border around the outside of the document margins. Page borders are primarily for decoration; you can use any style, color, and line thickness you want. You can also apply graphical borders (or border art) that repeat a small image as a pattern. Start Word, if necessary, and start a new blank document. 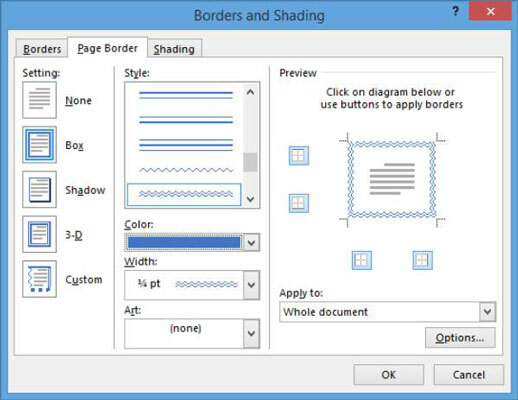 The Borders and Shading dialog box opens with the Page Border tab selected. In the Style section, scroll down and select the double wavy line. Then from the Color drop-down list, choose Blue, Accent 5. If a preview of a blue wavy line doesn’t appear in the Preview area, click the Box button to apply the current settings to all sides of the page. Some line styles have a variety of widths you can choose from; the double wavy line you select in Step 3 has only one width available. For extra practice, try clicking the None icon and then clicking one or more individual sides in the Preview area. This is how you apply a page border to only certain sides of the page. When you’re done experimenting with that, click the Box icon again to apply the border to all sides again. 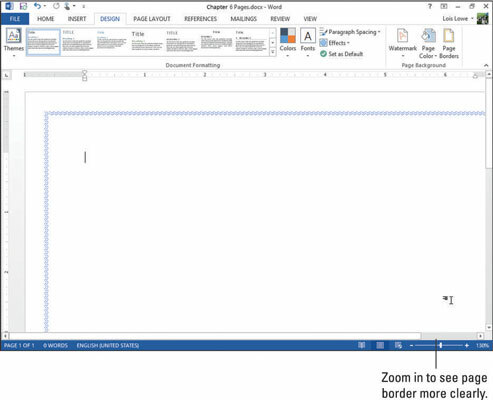 The border is applied to the blank page. Zoom in to see it better if desired. Page borders, like many page-level formatting elements, appear only in certain views. You don’t see them in Draft, web Layout, or Outline view. Choose Design→Page Borders to reopen the Borders and Shading dialog box. From the Art drop-down list, choose the palm trees; click the down increment arrow on the Width box to set the width to 28 points; and then click OK. 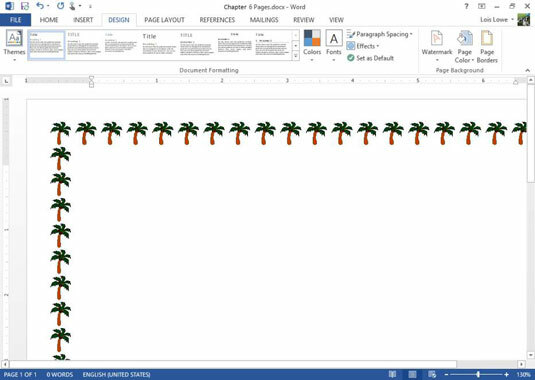 The palm tree border is applied to the page.